In ‘The Open Window’, when the supposedly dead father and sons turn up to terrify Mr Nuttel, what does the youngest son sing to his little brown spaniel? In ‘The Boar-Pig’, what kind of pig is Tarquin Superbus? At the beginning of ‘The Chaplet’, what tune is the orchestra playing in the Amethyst dining hall of the Grand Sybaris Hotel? In ‘The Lumber Room’, Aunt gets trapped in something when she goes to the gooseberry garden. What does she get trapped in? In ‘The Schartz-Metterklume Method’, how does Lady Carlotta, impersonating the governess Miss Hope, describe the Schartz-Metterklume method of teaching children history? In ‘Sredni Vashtar’, what kind of hen does the lonely and poorly boy Conradin lavish much affection on? In ‘The Storyteller’, what is the first line of the story told to the bored children by the bachelor? In ‘The She-Wolf’, what kind of wolf does Clovis Sangrail borrow from the animal collector Lord Pabham in order to expose Leonard Bilsiter as a fraud? 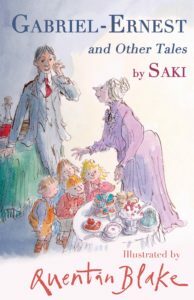 An eerie and disquieting tale about the dark side of adolescence, ‘Gabriel-Ernest’, written with Saki’s trademark wit and mischievousness, is here presented with seven other uncanny and macabre tales, featuring Quentin Blake’s inimitable illustrations.